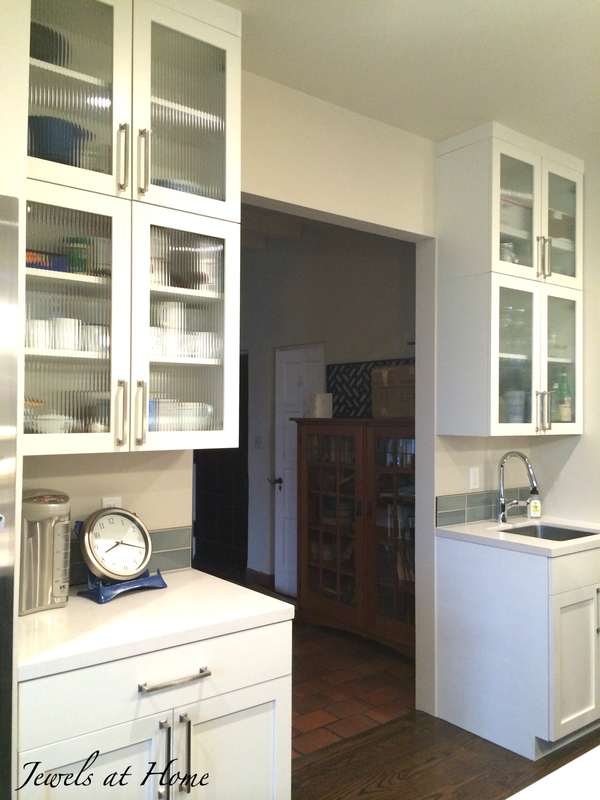 When we renovated our kitchen, I couldn’t bear to see the fresh new space get all cluttered up. I wanted to ooh and aah at the gorgeous counters and tile all day. So, I went on the search for tips and tools that would help keep our space looking organized, and here are my favorites! After almost two decades of marriage and three kids, Steve and I agree on so many of the most important things. And yet, the topic of where to dry our hand-washed dishes became a battle. He was all for function – big clunky red dish drainer sitting on the counter. I was for form – hide the drying dishes inside a sink. In the end, I conceded that there were better uses for our sink, so I set out to find the most unobtrusive dish drying racks possible. I settled on this OXO Good Grips Large Silicone Drying Mat for drying large items and this OXO Good Grips Dish Rack for reusable water bottles and lunch containers. These are both compact enough to store under the sink, when we’re not using them. Is this a new thing? I don’t remember seeing them before, and now it seems like everyone has one! I tuck our bottle brush next to our suction cup sponge holder , so it also stays off the counter. We hide most of our kitchen utensils in a drawer next to the stove, but I like having a few frequently-used items at our fingertips, including the dip-painted utensils I made for holiday gifts last year. A clear vase or mason jar gives a clean look while showing off those pretty painted handles! I like having the knives out of the way, both for safety and to free up the counter. There are many varieties of these knife blocks, so you can find one that’s perfect for your needs. 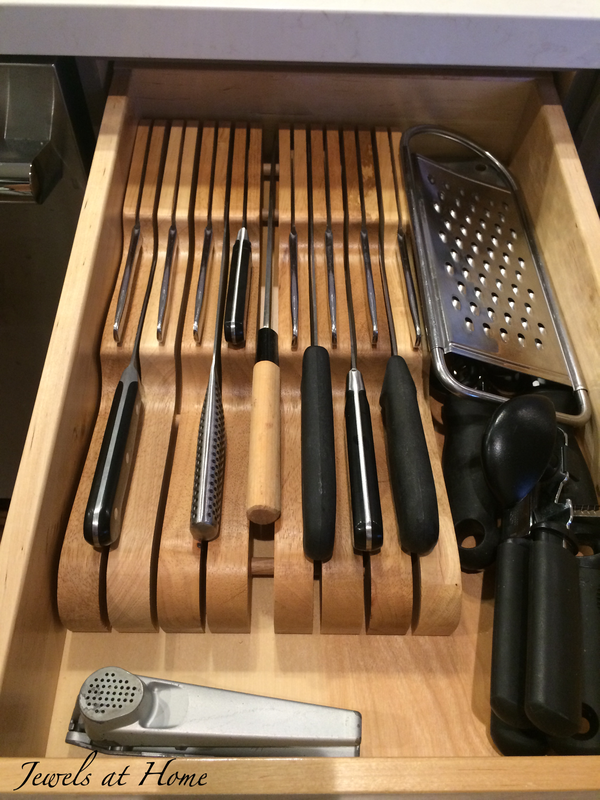 We have the Victorinox Swiss Army 14-Slot In-Drawer Cutlery Tray , which leaves us a little room left over scissors and other kitchen tools. 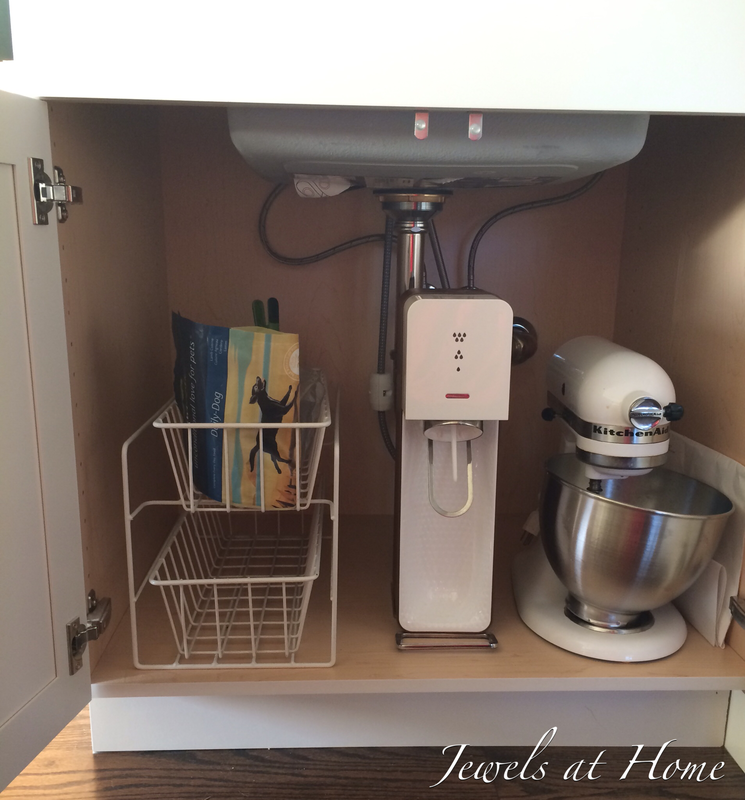 There seems to be a gadget for everything these days, and it’s hard to find a place for the waffle iron, the crock pot, the mixer… We compromised by leaving a few daily essentials – the toaster and coffee/tea supplies – out on the counter, and the rest are stored in cabinets. I put the heavy and/or heavily used items down low and the rest in our high cabinets that we access less often. Using a tray to collect smaller items definitely clears off the counter. My friend Ariana wrote a great post about using trays over at Revolving Decor. Her site has a daily blog and listings for great used furniture. Measure your space, and you’ll find the perfect garbage can, shelf, or organizer to make the most of the area under your sink. 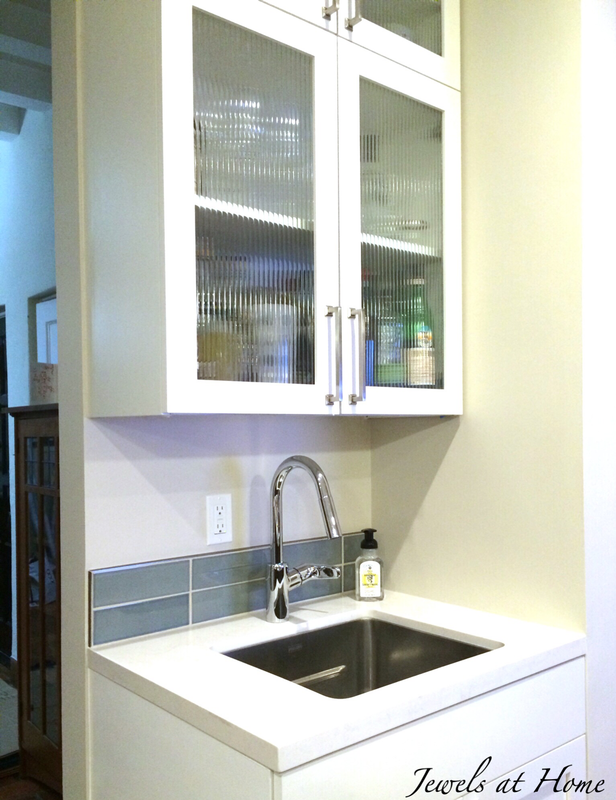 I like the look of glass fronts on cabinets, but I didn’t want to worry about keeping everything perfect inside. This fluted / reeded glass pattern gives an open feel and a glimpse of the cabinet contents, without sharing all the details! 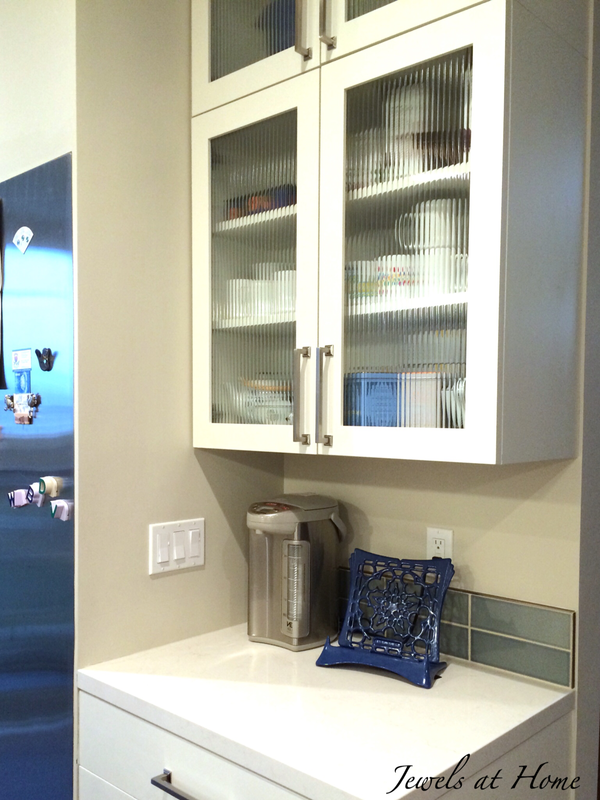 If you already have clear glass in your cabinets, you can add Etched Glass Window Film to your glass. I did this to a hall cabinet we have upstairs. The last tip for a clutter-free kitchen isn’t in the kitchen. We have an overflow pantry area in our basement that has a deep freezer and all the extras of pantry items and kitchen supplies. Looking for more beautiful and functional finds for your kitchen? I always find some good deals on great items at Zulily! Those who know me might be surprised that I am writing about organizing, since I’m definitely not the neatest person around, but that means that if I can do it, so can you!